It happens sometimes that you simply can’t access the file on a certain PC – when you click it, it comes up with an access denied error. Maybe you received the file from someone else or got it transferred from one PC to another, and then you realize that there is something wrong with it. Naturally, this can be more than irritating; especially if you are in a hurry to do something urgent. But don’t lose your temper, since the issue is rather simple and often there is a workable solution that you can implement by yourself. This can file access problem could be caused by two things: either you don’t have enough rights for opening that file or it is encrypted. Both of the situations are not too hard to fix and the only thing you need to do is follow few simple steps in order to get it completely back under your control. 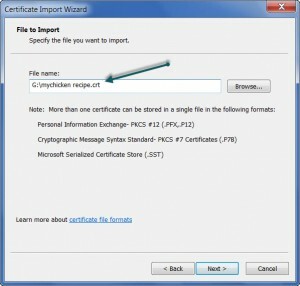 If the file is encrypted, it is necessary to have the certificate to decrypt the file. The certificate can and has to be provided by the person who created the file. The process is very simple to see if it is an encrypted file. 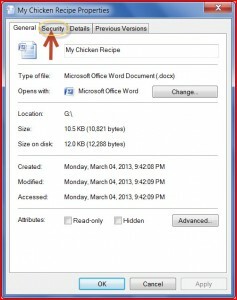 So let’s say you have a file named “My Chicken Recipe” that pops up with access denied when you try to open it. Just right click on it and go to properties screen as shown in image below. You will get the main menu which contains several different options. You need the advanced options which contain information about encryption. After pressing the “Advanced” button you will get the screen that offers you the option of encrypting a file. See if the “Encrypt contents to secure data” check box is selected there. If you find this option selected, you need the right certificate from the person who encrypted the file. If you manage to receive the certificate from the person who sent you an encrypted file, save this certificate file in a particular sub-folder of your choice. Usually the certificate file has (*.cer) or (*.crt) extensions. 1. Click on your windows “Start” button, type “certmgr.msc” inside the search box and hit enter. 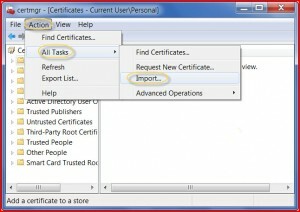 This will launch the certificate manager as shown in image below. You must be logged in as an administrator to do this. 2. Click on the “Action” menu on the top menu bar, then “All Tasks” and then click “Import” as shown in figure below. 3. This will launch a new window. Click “Next” at the bottom of this window and you will reach the next window as shown in the image below. Here on this screen, just locate the certificate file (example: Mychickenrecipe.scr) from the right folder and hit “Next” again. Your computer will do the trick to decrypt the file according to this certificate and make this file readable in your PC. There is also a possibility that your account (which you have used to log in) simply don’t have the rights needed for the manipulation with a specific file. That can be solved pretty quickly as well if you possess the administrator rights on your PC. The process is very similar to the one we just used for encrypted file. You need to right click on the file and you will be getting the same message as in the first case. The only difference is that you need to hit the “Security” tab in this case as shown in the image below. When you get there, you will see a list of the users in front of you as shown in the image below. You need to choose the “user name” you are logged in with, and to authorize it for using all of the files and performing all of the possible operations. 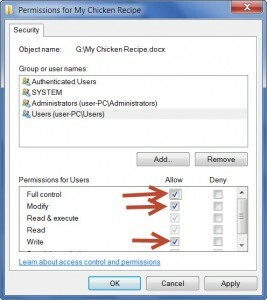 For example, I am logged in as “User – PC” and you can see inside the permission window, I only have “read & execute” and “read” permissions. With these two permissions, I won’t be able to write or modify anything to this file. So to empower this user account, just select all the other permissions under the “Allow” column and hit apply as shown in the image below. This will give you all the rights you need to do anything with this file. 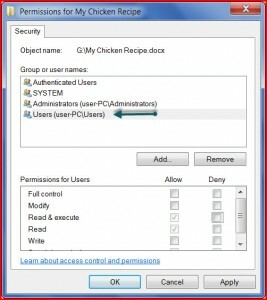 This access control and permission screen can be used for many other important purposes including adding and removing users from various groups, and controlling various users on how they access resources on a certain PC or network. It makes sense to have a look at some of the useful things you can you do here to maximize your computing efficiency.